I’ll be participating in the Library Student Day in the Life project by Hack Library School during the first week of March. Mostly, during that week I will be working on class projects, interning, working, and job hunting. Then, each day I’ll blog about it! I’m very excited to see what other people involved are are doing while in school. I can’t wait! For this month’s entry into the TBR Challenge, I ran into a slight problem. I had planned to read a different book but did not have time to start and finish a new anything. However, I had gotten Cinder as a Christmas gift, started it back in December, and then set it aside. It also was recommended to me last fall by Jackie. Frankly, I was sold at “Cyborg Cinderella in New Beijing”. So, it seemed like a reasonable plan just to finish this instead of starting in on something new, even though it has not lived as long in my to-be-read pile as many others. Cinder, our spunky protagonist, is a mechanic in New Beijing. She has the requisite wicked stepmother, plus two step sisters (one of the wicked variety and one not). Cinder is also a cyborg, much to her chagrin. Along the way, she becomes entangled with the handsome Prince Kai, a mysterious doctor, plague research, and an evil Queen from the Moon with mind control powers. Sounds great, right? I definitely enjoyed this book. The characters are interesting, and the world is fairly complex. My only complaint is that I was left feeling like the book is mostly exposition for the rest of Marissa Meyer’s Lunar Chronicles series. 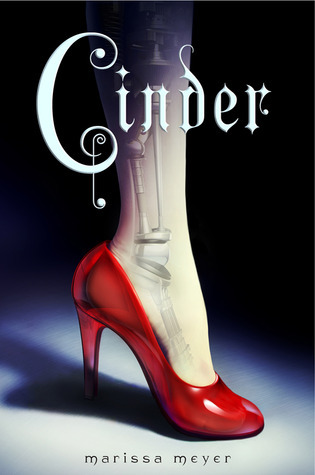 Cinder is such a fun character that I want to spend more time with her, so I’m nervous but intrigued about the fact that the next book in the series (Scarlet) will feature a new protagonist. However, I’m certainly willing to stick with this series to find out what happens. This entry was posted in Reading and Books and tagged books, evil queen, handsome prince, reading, series, TBR-challenge, wicked stepmother, YA on February 20, 2013 by michelejames.